We have already examined the single-column adders of Charles Pidgin and Charles Weiss, which are the first adding devices with electromagnetic operation. In contrast with the above-mentioned machines however, the device of the next inventor—Alexander Rechnitzer, was much more sophisticated and was put in serial production, even though in small quantities and without market success. 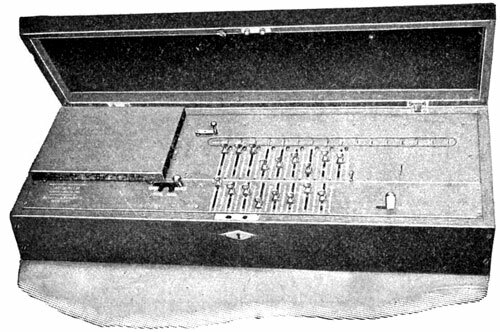 It was the world’s first motor-driven calculating machine and it was also the first machine to embody full automatic multiplication and division. 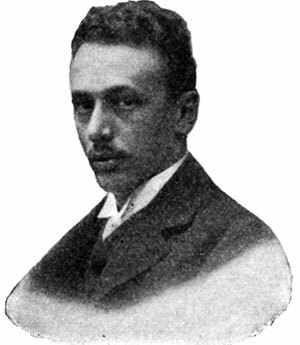 Alexander Rechnitzer, an Austrian Jew, born in 1880 in Preßburg (now Bratislava), Austria-Hungary Empire, is a holder of numerous patents for calculating devices in Austria, Germany, Switzerland, USA, France, etc. Rechnitzer appeared to be an extremely talented mechanic and versatile inventor, who built his first experimental model at the age of 19. One of his later patents is for talking calculating machine. Rechnitzer spent his youth in Vienna and studied at the Technical College. His first patent application he filled in November, 1900, in Vienna, describing a stepped-drum motor-driven calculating machine. Patent was granted in 1904 (see Austrian patent Nr. AT15514B). Several years later this patent will be implemented in the first in the world motor-driven calculating machine, put in serial production by the company Autarit GmbH, of Vienna, under the name Autarith. The machine was in production from 1910 until 1914 in small quantities. 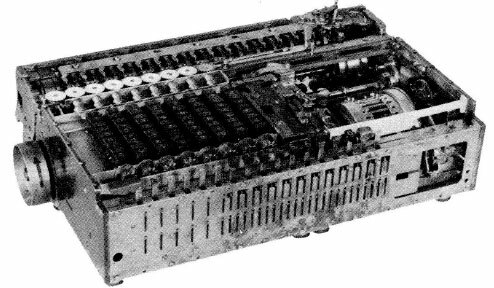 Based on and similar to the Thomas machine (stepped drums and 2 rows of setting sliders, one in the lower part and second on the movable cartridge beneath the result windows), this calculator also used an automatic multiplication and division mechanism patented by Rechnitzer, which will be used later successfully in machines like Madas. For addition, the first number is entered in the lower slots, the machine is set to addition by means of a button, the start key for the motor (of about 1/16 horse power) is pressed and the number is thus transferred into the result mechanism. For subtraction, the greater number is entered into the result mechanism (numerical wheels), the machine is set to subtraction by means of a button, the start key for the motor is pressed and the remainder can be seen in the result mechanism. For multiplication, the multiplicand in entered in the numerical wheels, the machine is set to multiplication moving the control lever, the multiplier in entered by means of the setting sliders, and the motor is started, causing the machine to complete the calculation automatically. With each revolution of the shaft, the settings slide, at the first place from the right, moves one digit towards the zero. When it arrives at zero, the carriage is automatically shifted by one place, and now the slide set in this place commences to move automatically towards the zero position, and so on, until multiplication is complete and the result is displayed on the result windows. Division was done by setting the dividend in the numerical wheels, the divisor in the lower setting slides, then moving the control lever to the divide position, whereupon the machine would automatically complete the calculation. The capacity of the machine is 16 figures in the product, though a more extended result is possible by resetting of the indicators for the handling of the remainder, which is shown with connection with an incomplete operation. The machine has produced 16-digit results in from 12 to 20 seconds. 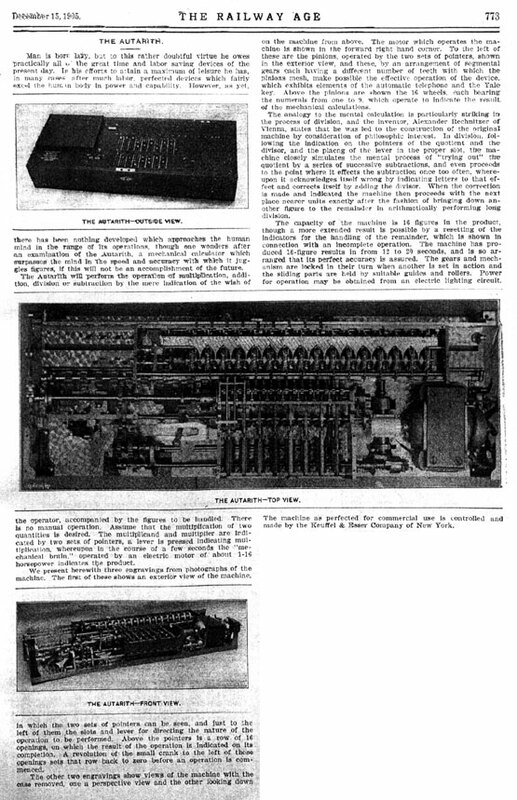 The upper picture shows Rechnitzer‘s final effort to produce a salable automatic four-rules calculating machine. He started the construction of this model in 1912. The pulley on the left end provided for a belt drive. 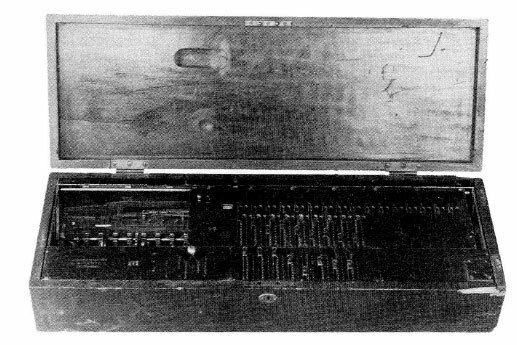 This machine can do automatic shortcut multiplication and full automatic division, and it contains a memory mechanism. The memory makes it possible to install a second multiplicand and multiplier while the machine is making the last preceding multiplication, and to install a new dividend during the computation of the last preceding division. In early 1900s Rechnitzer moved to live in Berlin, Germany. Starting from 1902, he traveled several times to USA, and it seems sometime during the years of WWI he settled permanently in New York. His machine was patented and introduced in several US magazines articles (under the name Autarith), including the Business World, Volume 25, November, 1905 (see the article for Autarith in Business World), and The Railway Age, 15 December, 1905 (see the article below). 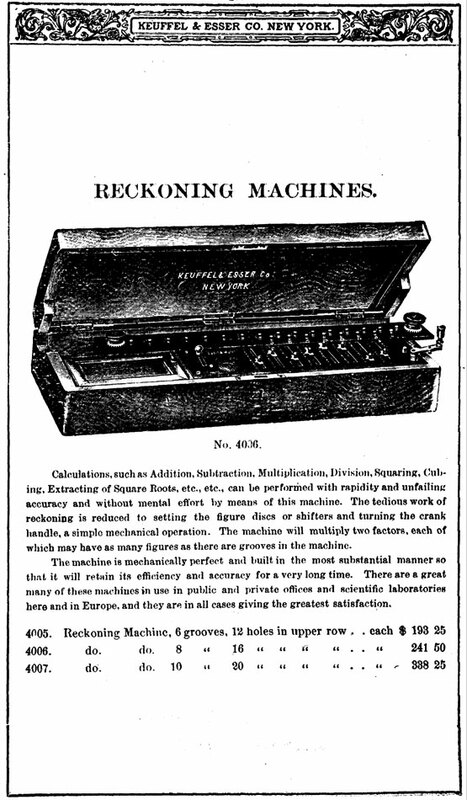 The machine was sold in USA by Keuffel and Esser Co., a drafting instrument and supplies company (the world's premier producer of slide rules), founded in 1867 by German immigrants William Keuffel and Herman Esser (see the page of 1903 catalogue of Keuffel & Esser). 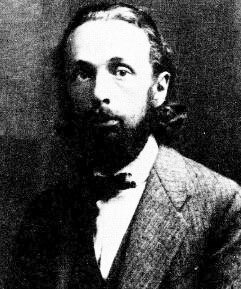 In 1906 Rechnitzer was granted his first US patent (№809075). He proved to be a brilliant engineer, but poor businessman and didn't manage to place his remarkable machines on the market. Financial conditions preyed on his mind to the extent that he became mentally unbalanced and died in despondency in April, 1922. His body was found in New York’s East River and finally found a resting place in the Potter's Field. But his life was not a failure, as his inventions have been widely commercialized by others.